You can regain your smile, your confidence, and your freedom, even in the face of missing teeth, with dentures and partials from Comal Dental in New Braunfels, Texas. Dr. David Earnest will design a custom dental prosthetic for you that helps you once again function fully and enjoy smiling. You can get back the healthy smile of your youth with a denture or partial denture. We will make sure to design a denture or partial denture for you that compliments your facial shape and fits your jaw comfortably. A great fit is essential for good, reliable function, and we won’t consider your denture or partial complete until we get the fit just right. Full dentures, which replace all of the teeth along an arch, rely on natural suction for stability, and the better the fit, the better the suction. 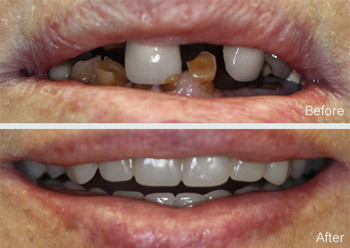 Partial dentures, which replace various missing teeth when others still remain, are held in place by a framework that clasps to remaining teeth. Dentures can also be designed to be fit to dental implants, giving you even greater stability and confidence while wearing a denture! Dentures and partial dentures are a popular option because they’re so affordable. We also offer bridges and dental implants to give you flexibility when determining what type of tooth replacement you’d prefer. For New Braunfels, Northcliff, Seguin, and other communities south of San Marcos, Comal Dental is available to provide excellent dentistry that leads to beautiful results. Contact us today to make an appointment with Dr. Earnest and the team.